Early progressives (i.e. statists), like fascists in the first half of the 1900s, saw great value in war. It wasn’t the fighting that they craved, but the singular focus on mobilizing the nation’s population towards a common goal dictated by the state. Peacetime obstacles like liberty and individual rights, eroded or evaporated under nationalistic fervors whipped up in time of war greatly simplifying the state’s power expansion. 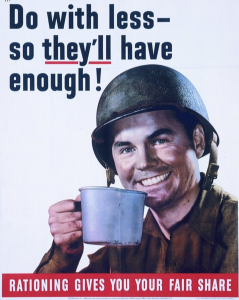 America saw this in WWII where citizens willingly sacrificed giving up sugar, or butter to support the war effort. Children enthusiastically scoured their neighborhoods for metal and rubber drives. Consumer product factories were happily converted to supply the military with equipment, and Americans did with less, or did without. Slogans like “Do with less-so they’ll have enough” were shown all over the country. Total war was responsible for total civil mobilization. Progressives continued to crave this war state power, and modern progressives came up with a strategy to get it free from the ravages of a hot war. They were wildly successful in the effort! What remains to be seen is “catastrophism’s” lasting effect. Will people wise up when the prognostications of doom don’t materialize, or will progressives get away with changing their narrative as they have in the past (ex. “Global Warming” vs “Global Climate Change”).